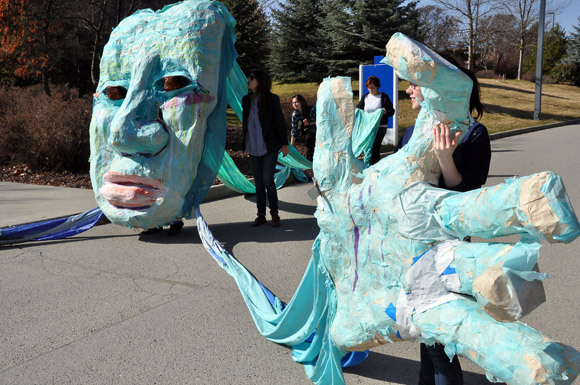 A"water puppet" made from papier-mache using recycled materials makes an appearance on UBC’s Okanagan campus during last year's World Water Day. The first event in this year’s World Water Week is intended to get more people “thinking like a watershed.” That’s the title of UBC’s Distinguished Speaker Series presentation Mar. 21 featuring Oliver Brandes, associate director of the POLIS Project on Ecological Governance at the University of Victoria. “Water will be the resource that defines prosperity in the 21st Century,” says Brandes, whose work focuses on the ecological governance of water sustainability, sound resource management and ecological-based legal and institutional reform in BC and beyond. The presentation takes place Monday, Mar. 21 at 7 p.m. at Kelowna's Rotary Centre for the Arts. For information about seat availability at this free public event, visit www.ubc.ca/okanagan/speakers. Each year, UBC's Okanagan campus commemorates the Mar. 22 annual International World Water Day with a number of presentations and activities aimed at promoting the importance of sustainable water resource management, says Doug Owram, Deputy Vice Chancellor and Principal. "Water preservation and conservation plays a prominent role in research and operations on our campus,” says Owram. "UBC will continue to foster partnerships with government, First Nations and community organizations to help ensure research-based, sustainable water strategies are developed that meet the needs of our communities and the environment in which they are situated." The World Water Week opening ceremony is Tuesday, Mar. 22, in the campus courtyard from 12 noon to 1:30 p.m. and will include a drum procession, musical performances and a barbeque. Opening ceremonies will also feature a welcoming address by Deputy Vice Chancellor Owram, who will present campus sustainability highlights, as well as presentations by Mayor James Baker of Lake Country and Mayor Sharon Shepherd of Kelowna. Other speakers are Nelson Jatel, stewardship director with the Okanagan Basin Water Board, and a representative from the Okanagan Nation Alliance. This year’s opening ceremonies have been organized by a faculty committee led by John Wagner, associate professor of anthropology, in collaboration with Leanne Bilodeau, director of sustainability operations, and Allisha Luther, World Water Day student coordinator with the Sustainability Office. Following the opening ceremonies on Tuesday, Brandes will present a version of his Distinguished Speaker Series talk from 2 to 4 p.m. in the Library Building, room LIB 305. Wednesday's highlights include a Poetry Slam by creative writing students from 2 to 3:30 p.m. in the Arts atrium (first floor of the Arts building). Running throughout the week is the World Water Day art exhibition, Art and Water, which is free and open to the public Monday through Friday in the FINA gallery from 8 a.m. to 5 p.m.
For a full schedule of World Water Week events visit www.ubc.ca/okanagan/events. More information about sustainability initiatives at UBC’s Okanagan campus is available from the Sustainability Office website at www.ubc.ca/okanagan/sustainability.